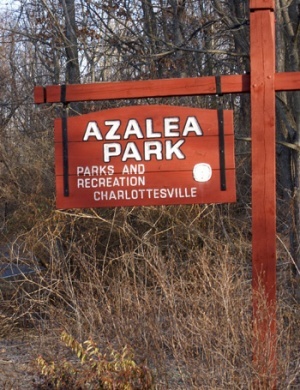 Azalea Park is a Charlottesville park located off Old Lynchburg Road near the city's southern border with Albemarle County. The park consists of 23 acres of flat land, a pathway along Moores Creek, two paved parking areas, a playground, a Little League baseball field, a concession stand, basketball courts, and swing sets. There is also an enclosed area for dogs to run off-leash. The City purchased the land from the Bellmead Corporation in two purchases made in 1965. Azalea Park is located off Old Lynchburg Road at the southwestern edge of the City near Interstate 64. Azalea Park received a $900,000 makeover in the fall of 2012. City Council began a master planning process for Azalea Park at their meeting on September 21, 2009. Planning meetings occured at Cherry Avenue Christian Church. A new trail connecting the park to Monte Vista Avenue opened in the fall of 2010. Construction is scheduled to occur in the fall of 2012. The dog park and the playground will switch locations. A new bike facility will also be built. . Additional, a new wetland will be created to help mitigate stormwater runoff from the 40 acres of the Fry's Spring neighborhood. This project will be funded in part by the Virginia Department of Conservation Recreation. This project will help improve quality on Moores Creek and will also count towards the city's mitigation of the Chesapeake Bay. The Virginia Department of Forestry awarded a $7,500 grant for construction of a biofilter as part of the project. Construction will continue through 2014. ↑ Web. Azalea gets overhauled after long public process, C-VILLE Weekly, Portico Publications, April 26, 2016, retrieved June 28, 2012. ↑ Web. Neighborhood Development Services News & Notes, retrieved October 22, 2010. ↑ Web. Azalea Park Improvements - Implementation and Timeline, Chris Gensic, January 31, 2011, retrieved February 15, 2011. ↑ 5.0 5.1 Web. Azalea Park Stormwater Wetland Grant Award - $119,000, City of Charlottesville, retrieved June 6, 2011. ↑ Web. October 17, 2011 agenda (with background material), City of Charlottesville, retrieved October 17, 2011. ↑ Web. Azalea gets overhauled after long public process, C-VILLE Weekly, Portico Publications, June 5, 2012, retrieved June 15, 2012. Print. June 5, 2012 , 24.23, . ↑ Web. Resource Review - A Newsletter of the Thomas Jefferson Soil & Water Conservation District, Thomas Jefferson Soil & Water Conservation District, May 2012, retrieved July 16, 2012. This page was last edited on 2 January 2017, at 14:57.